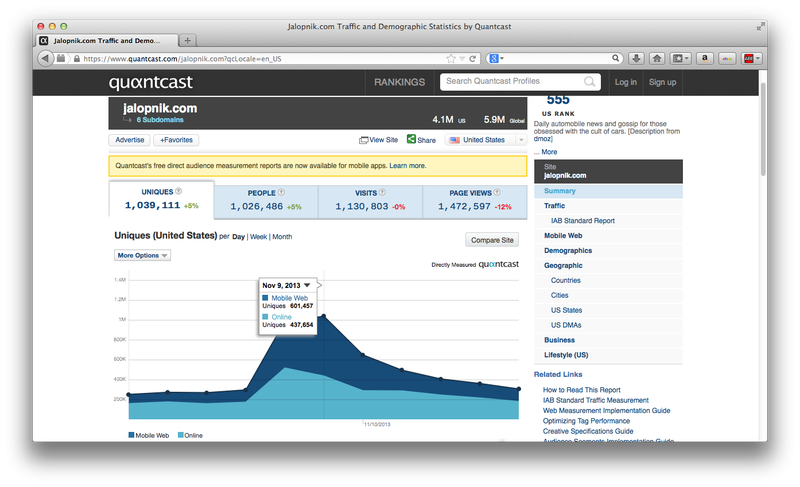 I was looking at the Quantcast site traffic stats for Jalopnik (sometimes I like looking at random data, don't judge me), and I noticed this massive spike on November 8-9. Most of the time a day's traffic is in the 250,000-350,000 unique visitors range, but on the 8th it rocketed to 991,000 and the 9th it climbed even higher to 1.04 million. For a reference of scale, if those 1.04 million people were all in one city it would become the tenth largest city in the United States, slotting in between Dallas and San Jose. I checked and this is the most active day on record for Jalopnik, and the only time the site has had over a million unique visitors in a single day. For the life of me I can't think of any big news around that time that would cause such a spike. Anyone know what it was? As a side note, Oppo's biggest day was October 2nd, with 176,000 visitors.